Mining Equipment Market size was valued at over USD 70 billion in 2017 which is expected to grow at over 5% CAGR from 2018 to 2024. The global shipments are expected to surpass 450 thousand units by 2024. Rapid evolution in mining processes and a rise in the adoption of automated solutions in recent years are predicted to drive the mining equipment market over the forecast timespan. Several players are providing smart solutions to their customers for improving productivity and enhancing the efficiency of industrial operations. These smart solutions offer features such as real-time control & monitoring, will optimize production management, and enhance the decision-making approach. This has led to players integrating these advanced solutions into their products to enhance the productivity and reliability in mineral extraction processes. For instance, smart extraction solutions offered by Wipro Limited include advanced analytics, short interval control, mobile asset visibility, remote operation centers, digital work management, and mobility platform. With the integration of advanced digital technologies, customers are able to maximize the Return on Investment (ROI). Such factors are anticipated to facilitate the expansion of the market in industrialized countries. With an increase in demand for exploration machines and robotics, companies are replacing legacy mining methods, providing an impetus to the mining machinery market. The replacement of automated solutions in place of manual processes helps in reducing the number of accidents in handling and performing activities. Moreover, automation and robotics technology incorporated with the complex and heavy machines is enhancing the overall productivity. High investments of market players in R&D activities to provide technically-advanced machinery with greater efficiency, reliability, and the ability to sustain the rising competition are creating several growth opportunities. Over the coming years, the commodity prices are anticipated to witness an upswing, thereby fueling the market demand. In addition, a renewed strength in construction activities and the rise in manufacturing output in the developed markets will support the industry growth. In 2017, surface mining machinery market accounted for over 30% of the overall industry share. These machines are experiencing a high adoption due to the rise in demand for extraction of minerals such as non-metallic ore, metallic ore, and coal. Several new techniques are being developed depending on mining tasks such as mountain removal, strip, and open pit. The rising demand for mineral and metal commodities is projected to drive the mining equipment market growth. This equipment aids in cost optimization due to its ability to cut, crush, and load in a single working process. The growing demand for technically-advanced solutions and a rise in mining activities in developed markets will fuel the industry growth over the coming years. Countries including Brazil, Russia, India, and China have a high abundance of natural resources and a high rate of coal production. These countries are experiencing a high adoption of this equipment for performing coal extraction activities. Metal mining is anticipated to witness a steady growth over the coming years owing to the rise in disposable incomes and improved living standards that have fueled the demand for precious metals such as gold, platinum, silver, and other commodities. The rise in demand for this equipment for metal extraction will drive the mining machinery market. Metals such as aluminum, copper, zinc, lead, and nickel are being utilized in several industrial sectors such as construction, chemical, and energy & utility for performing manufacturing operations. The rise in industrialization and urbanization trends in developing countries are providing numerous growth opportunities to the market players. Manufacturers are offering products with GPS technology and other electronic control modules and database tools for improving the product offering. Moreover, the replacement of aging infrastructure and development of new buildings for the safety is generating a high adoption of the metals such as iron and steel in construction activities, thereby driving the market size. 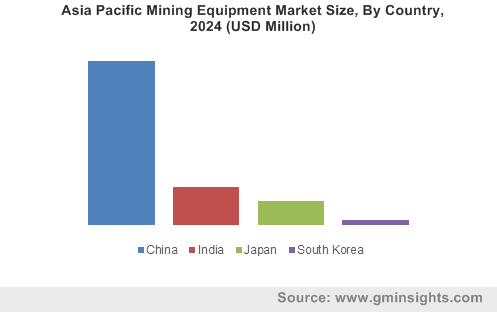 Asia Pacific mining equipment market is anticipated to grow at over 6% CAGR over the forecast timeline. Lack of mechanization rates in Asia Pacific countries is anticipated to drive the sales. Many developing countries in the region have sizable coal producing areas and significant coal and metal mining industries that need a substantial level of capital investment. Increasing demand for lower emissions, low cost, and high energy-efficiency machines is being witnessed in the region. Growing availability of lease-based model will encourage end users to use advanced machinery. 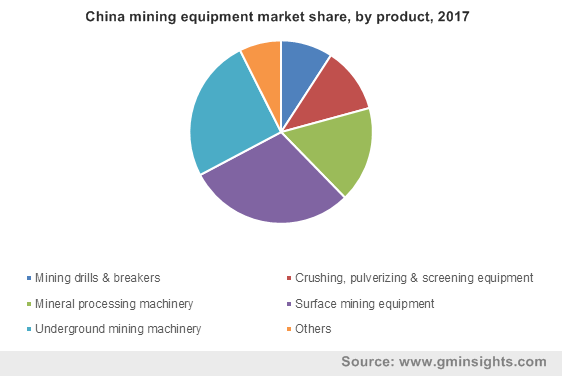 A rapid increase in the construction activity and manufacturing output in China, coupled with government efforts to boost the mechanization of mines, have led to a rapid growth of the mining machinery market in the country. Moreover, the India market is anticipated to witness a steady growth owing to a rise in mining output growth and a significant need for mine mechanization. 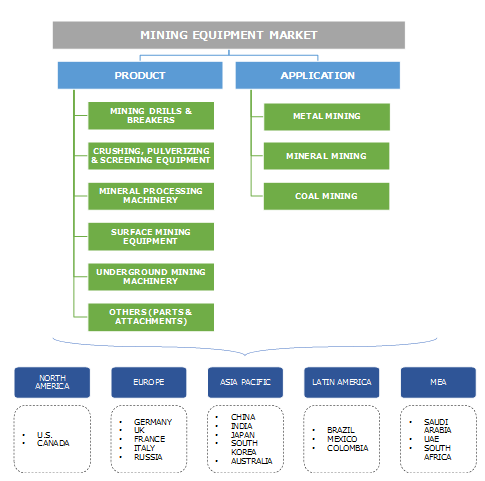 Major players operating in mining equipment market include Caterpillar, Inc., Metso Corporation, Komatsu Ltd., Atlas Copco AB, Sandvik AB, CNH Industrial NV, Hitachi Co., Ltd., AB Volvo, Doosan Group, Liebherr Group, Astec Industries Incorporated, Bell Equipment Limited, China Coal Energy Company Limited, Bradken Limited, Corum Group, Hyundai Heavy Industries Company Limited, Kopex SA, RCR Tomlinson Limited, Techint Group, Terex Corporation, and Wirtgen Group Holding GmbH, among others. These companies are offering several products to governments as well as the private sector for performing mineral extraction processes. The products offered by the mining machinery market players are designed based on the industrial specifications and requirement for performing specific tasks. These players have a strong presence in the countries where the demand and availability of the minerals are high. Technological advancements and innovations are expected to drive the mining machinery industry growth. Several technologies that are revolutionizing the industry include automation, Internet of Things (IoT), 3D imaging, and plasma technology. These machines are developed using materials and technologies that can withstand high temperature and pressure. The machines are exposed to high radiation and chemical substances that can directly affect the functioning of the parts. 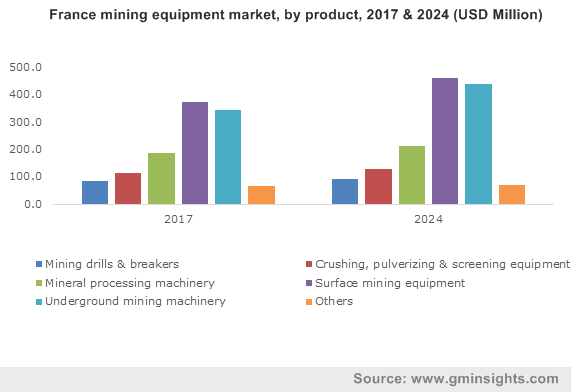 The players in the mining equipment market are focusing on such challenges and are developing machines that can be used for the extraction of specific minerals or metals. Remote monitoring and control devices are integrated into these machines to provide careful observation of the processes and activities from centralized systems. It provides maximum efficiency, improves safety, decreases the variability, and allows better identification of performance issues. Such factors are expected to drive the market growth.